Mr Austin Uche...DR MORINGA , a  PAN_AFRIKAN visionary, a determined natural herb healer follows the essential life testimony "HEALTH IS WEALTH". He pledges to play his part in the strengthening of the health of AFRIKAN people so that they actively build the continent and the world at large. He acknowledges the prevalence of modern sicknesses and believes that "NATURE TREATS NATURE". "Stigma generally attached to African herbs. The Western world who wanted to promote their pharmaceutical industry and amass wealth painted natural indigenous herbs and practices thereof as pagan or evil"
I started knowing about Afrikan herbs from my grandmother when I was about 6yrs of age. She used to use herbs to heal people in the family and around too. She told me about how Afrika was blessed with life and natural herbs and knowledge and wisdom by God and she always emphasized that we must not forsake this divine heritage from God who created our ancestors. It’s unbelievable!. After she passed flesh nobody continued with the healing at home. One day in my sleep she appeared up me and called me by my Igbo name ‘KELECHI’ which means thank God. She said “my son don’t let my dream die or be forgotten. Continue where I left.” She stretched her hand and touched me and showed me a tree called DOGONJARO which she used a lot while she was still in her flesh (alive). I woke up. I was 20yrs old then. I traveled to Lagos and started attending church. In church every last weekend of the month we used to go camping and fasting in the Mountain of mercy in Ekiti state. One night in that mountain I overheard and eavesdropped the conversation of 3 elders discussing the Moringa tree. One day I asked an elder called Mr Maze Onyenso about the Moringa tree.he said to me “my son Moringa tree is a miracle tree of life which cures over 300 sicknesses in the human body “I requested him to show me the tree and he took me to the home of another elder in another village called Korodi who has the tree at his yard. I started in Lagos selling moringa herbal products of different packages and other indigenous herbs too. Things didn’t go with maximum momentum. One day I decided to travel to South Africa to meet my friend therein. In SA one day I was arrested and put in the police station cells. In the cells my grandma came in a vision and said “my son go back to what you know best and don’t do anything you don’t know or that will put you in trouble in life .you are a saviour of life ….” after waking up I thought of what I can do and remembered what my grandmother had said to me sometime back about continuing from where she left. Having been released from cells I used the last money I had and posted it back home for my friend to buy n send me some moringa herbs. It is that stock I started with. I had no shop so I used to sell at the taxi rank where I could meet many people from different places. I introduced the Moringa tree to the people around and explained it’s health benefits. The Moringa tree and herbs grew in fame and people started calling me Dr. Moringa. With the belief in the divine powers, I persevered and continued selling the herbs to earn a living while healing the people. After a while, I could afford a shop from which you operate and the clientele grew. The biggest challenge have been finances to make this business grow to my envisioned level because this is big and we need lots of things and machinery too so that we can even improve on our packaging to meet the modern standard. Another issue is the stigma generally attached to African herbs. The Western world who wanted to promote their pharmaceutical industry and amass wealth painted natural indigenous herbs and practices thereof as pagan or evil. So our Afrikan people sometimes prefer to go for and spend in western medicine. This cripples the growth of indigenous healing businesses. Processed medicine is less powerful than original organic herbs yes our Afrikan people must realize this and change their attitudes so that we grow in health as a nation. A healthy nation can build itself and improve its standards of life using its indigenous resources. Sometimes there are those who discourage me against this healing business especially in times when I can’t make enough to cover all my needs and bills. So yeah this creates internal pressure to you see but we learn to overcome that. hahaha….. mostly I don’t feel bad now because I have come to self realizationion and I believe in me. I believe my dream is life itself . So when i realise any discourages me or doubt me I feel inspired to work more and increase my creativity in my business. What message do you have to those that doubted you? I thank them for fuelling my inspiration in my business and it is such attitude that built me into a strong African conquering lion I am. What makes a man in life is even doing successful things which prove those who are contrary that a gift is God in a person so God is limitless. Dr Moringa “firstly I encourage my African sisters and brothers to discover themselves and stand for who they are and live to manifest the God in them . Never let your gift remain silent till you go with it to your grave. Be confident in yourself get up wakeup be a servant to your nation. Yes, never give up in the good you do no matter the obstacles . Your health is the basis for your wealth. Use organic African herbs to empower your health . These herbs contain the life force of God when u use them you absorb the life force of God into your body . Eat healthy too . With our health, we can build AFRIKA. Township in South Africa reflects the celebration of joy in human rights, freedom, justice and reconciliation. From the experience of shebeens to visits with sangomas. A township visit is an emotional and unique sensory experience that is abuzz with the vivid social culture. Each township tells a story of its own about how it was established, the struggle through the years of apartheid and the current age it has evolved into. South African townships have an irresistible soul and vibe that will welcome you and give you the experience of a lifetime! Alexandra is affectionately known as ‘Alex’, it is Gauteng’s oldest township. Initially, it was established as a residential area. This was in 1905 by a white farmer. He aimed for a white suburb and named it after his wife. In 1912 it was transformed into a native township. Black people were allowed land ownership. In 1913 the land act dissolved land ownership rights by blacks. Alexandra continues in migration as it was close in proximity to the employment opportunities in Johannesburg. ‘Alex’ has an interesting and turbulent and past, a fascinating present, and a very promising future. It also has it’s own community radio and TV station. Alex is the hub of culture, root culture is rhythm and vibe. Alex has been home to luminaries like Hugh Masekela, a renowned jazz maestro as well as Nelson Mandela. Popular culture like theaters in the townships was a dynamic force which gave life and hopes to the people, it’s a dynamic force that gave hope. A township tour will give assess to the best shebeens in where you can quench your thirst on the tradition umqombothi, an African beer that is home-brewed, and taste amazing local delicacies. You can also stock up on arts and crafts from street vendors, curios and explore the world colorful traditional medicine world. The outdoor markets, the St Hulbert Catholic church, Mandela Yard Precinct and traditional healers create a fascinating new and old blend making Alex a fascinating township tour. Soweto is the fifth most popular destination for overseas visitors to the Gauteng province. It’s ‘Jozi’s’ tourism drawcard. And one of the biggest attractions is the Mandela Museum, in Vilakazi Street. The former four-roomed home of Nelson and Winnie Madikizela-Mandela is a deeply moving experience, that reminds us of our past, and gives us hope for the future. Soweto tours start with, Hector Pieterson Museum and the Regina Mundi church.No trip to Soweto in Johannesburg is complete without a visit to Regina Mundi, the largest Catholic Church in the most popular Soweto. It’s been a spiritual haven for thousands of Sowetans, it has also played a pivotal role in the township’s history of resistance against apartheid. The Ubuntu Kraal is a collection of straw-roofed rondavels that form a homestead, popular as a wedding and conference venue. The venue is the magnificent Walter Sisulu Square in Kliptown, the site of the signing of the historic Freedom Charter by anti-apartheid organizations in 1955. This is the ideal place for the people of Soweto to congregate over Heritage weekend as the Square is a national monument. The Soweto Festival centers around an exhibition and day-long entertainment events. 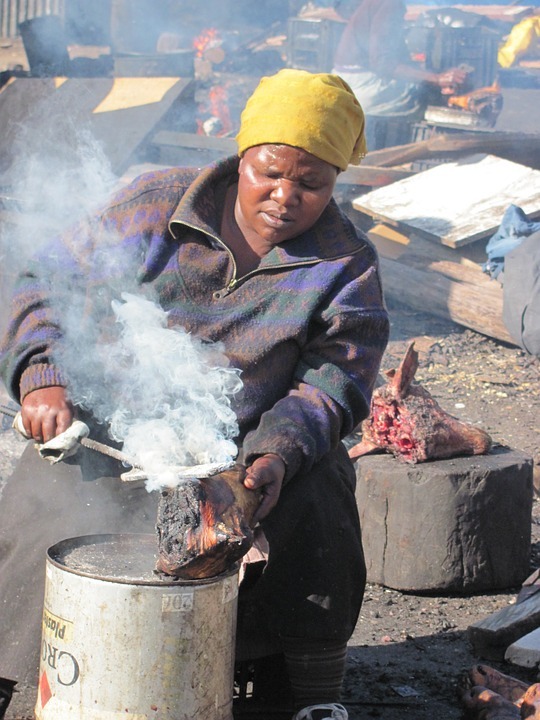 The Katlehong township area smoldered with political tension in the early 1990s and the name was associated with violent protests and a low-level civil war amongst factions. This, however, is a thing of the past and in some way seems to make the Art Centre even more of an achievement for being there. Some of the most exquisite examples of ethnic artwork are housed here and the center seems to have been as influenced by the emotional turmoil of the township as its inhabitants once were. Welcome to motherland Africa! Welcome to South Africa!